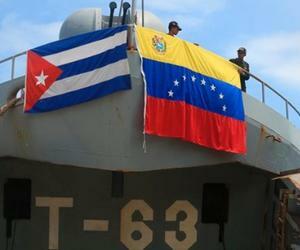 Tango 63, a ship belonging to the Venezuelan Navy, carrying over 300 tons of humanitarian aid, was officially received at the Santiago de Cuba port. Lazaro Exposito and Nancy Acosta, president and vice-president of the Santiago de Cuba and Guantanamo Civil Defense, respectively, along with René Mesa, Cuba´s Minister of Construction, welcomed the crew and its captain Leonardo Castellano. The Venezuelan ship brings construction equipment and materials to repair the houses and infrastructure of the areas battered by Hurricane Matthew last October 4th. Milagros Rodriguez, an attaché of the Venezuelan embassy in Cuba, forwarded a greeting form President Nicolas Maduro and added they deliver this aid with lots of love and solidarity. Matthew hit the easternmost Cuban province of Guantanamo as a category four hurricane, wreaking havoc in 4 municipalities: Baracoa, Imias, Maisi and San Antonio del Sur, leaving on its wake great damages to roads, the electric grid, communications, and up to 90 percent of buildings in some of the towns. Thanks to the timely measures taken by the Cuban Civil Defense and the readiness of the people, no human lives were lost despite the strength of the storm.